I got to use my mother’s camera for this because I still can’t find mine. Just a few weeks ago, I was able to create a timeline for the beginning of my first book. I needed something that would be able to help me sort my thoughts and ideas, so I just started it. I know that I going to use this as a guideline to what is going happen. Though it is kind of similar to chapter focus the timeline it has a lot of detail. I am having difficultly with the actual timing and pacing; I am trying to figure out which month I should start in. This may not be as important to some writers of what month starts the novel, but for myself I would like to get the pacing just right. Namely because of my main characters birthday. So far I haven’t continued with the timeline. I don’t want to the timeline to be finished before I write the novel. I am going to try an write it at the same time. But I have a feeling that I won’t finish the timeline. But other than timelines, I was thinking of how much my information in the book is all over the place because of poor judgement. (Not leaving enough paper for a certain sections.) I going to go to the store and buy tab markers, but I noticed how many paperclips were sitting underneath my desk. The color on the paperclips were going to help me keep track of the things that were similar and different. It also helps keep sections together. Sectioned off by colored paperclips. 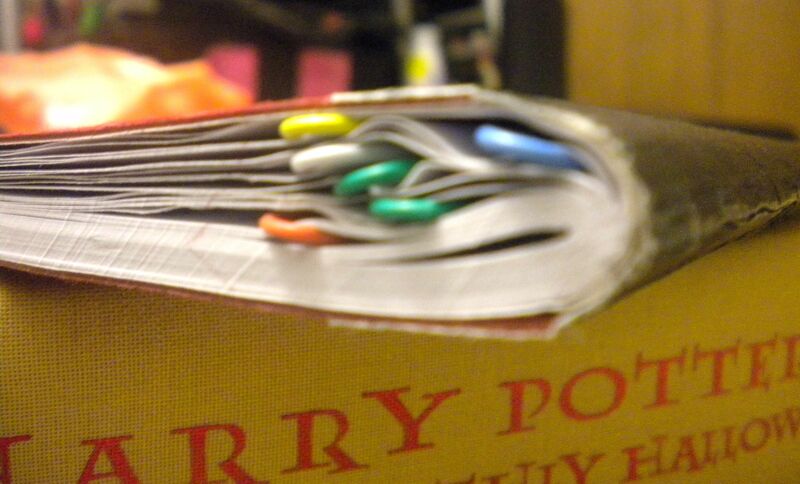 And yes, I am reading Harry Potter. I intially first put the paper clips on the outside edge of the notebook, but it was annoying to remove them. Then I just moved them so that they were near the binding. It still allows for flipping through pages but it keep the pages I wanted together. 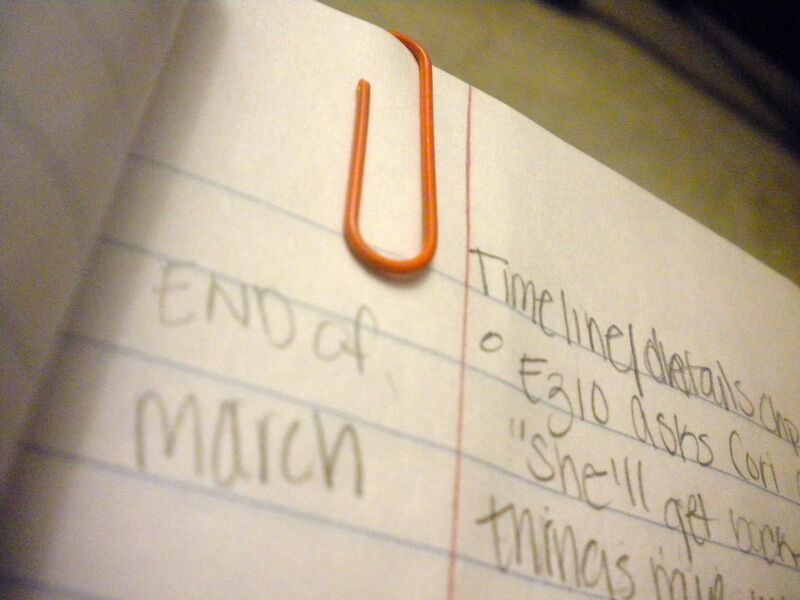 The paperclips, may, depending on the type of notebook that is can be damaged. Like mine. I hope this trick saves people money, instead of buy the tab markers. I got my colored paper clips for 99 cents and my University bookstore. I have also been debating whether or not to read 50 Shades of Gray. I read a sample on my kindle and I liked what I read, but I have been reading and I have heard good and bad things about it. I read a review for it and I laughed. Seriously, the review of it is on Goodreads.com. It’s worth reading. I am going to borrow it from the library and see if I want to read the other two books. Posted in Book, Writing and tagged book, chapter outline, characters, fiction, focus section, notebooks, novel, organization, write, writing. Bookmark the permalink.